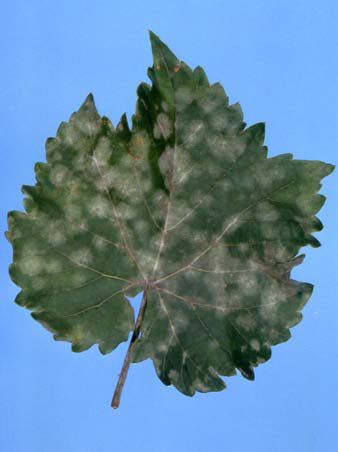 Powdery mildew is an important disease of grapes worldwide. The disease generally is considered less economically important in Ohio than black rot or downy mildew. However, uncontrolled, the disease can be devastating on susceptible varieties under the proper environmental conditions. 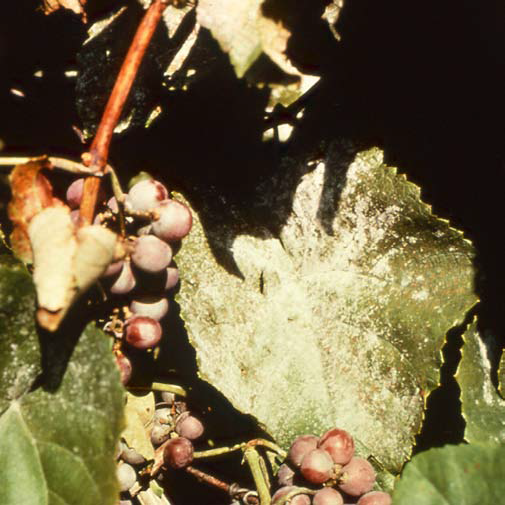 Unlike black rot and downy mildew, the powdery mildew fungus does not require free water on the plant tissue surface to infect. Powdery mildew can result in reduced vine growth, yield, fruit quality, and winter hardiness. Varieties of Vitis vinifera and its hybrids generally are much more susceptible than American varieties. Figure 1. Powdery mildew colonies on upper leaf surface of infected grape leaf. 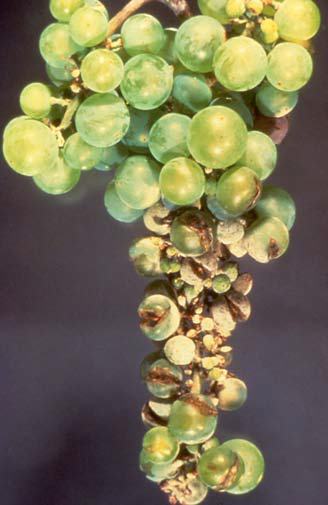 The powdery mildew fungus can infect all green tissues of the vine. Small, white or grayish-white patches of fungal growth appear on the upper or lower leaf surface (Figure 1). These patches usually enlarge until the entire upper leaf surface has a powdery, white to gray coating (Figure 2). The patches may remain limited throughout most of the season. Severely affected leaves may curl upward during hot, dry weather. Expanding leaves that are infected may become distorted and stunted. On young shoots, infections are more likely to be limited, and they appear as dark-brown to black patches that remain as dark patches on the surface of dormant canes. If blossom clusters are affected, the flowers may wither and drop without setting fruit. Infections on cluster stems often go unnoticed, but can be very damaging. Infected cluster stems may wither and dry up, resulting in berry drop (shelling). Affected berries may have patches of fungal growth on the surface similar to those on the leaves, or the entire berry may be covered with the white, powdery growth. Infected berries often are misshapen or have rusty spots on the surface. Severely affected fruit often split open (Figure 3). When berries of purple or red cultivars are infected as they begin to ripen, they fail to color properly and have a blotchy appearance at harvest. Berries are susceptible to infection from early bloom through three to four weeks after bloom. Late in the season, many black specks may develop on the surface of infected areas. These are the sexual fruiting bodies (cleistothecia) of the fungus. Figure 2. Grape leaf severely infected with powdery mildew. Note the white, powdery layer of fungal growth on upper leaf surface. Figure 3. Berry cluster infected with powdery mildew. Powdery mildew is caused by the fungus Uncinula necator. It was previously thought that the powdery mildew fungus overwintered inside dormant buds of the grapevine. Recent research in New York has shown that almost all overwintering inoculum in the northeastern United States (Ohio) comes from cleistothecia, which are fungal fruiting bodies that overwinter primarily in bark crevices on the grapevine. In the spring, airborne spores (ascospores) released from the cleistothecia are the primary inoculum for powdery mildew infections. Ascospore discharge from cleistothecia is initiated if 0.1 inch of rain occurs with an average temperature of 50 degrees F. Most mature ascospores are discharged within four to eight hours. Ascospores are carried by wind. They germinate on any green surface on the developing vine, and enter the plant resulting in primary infections. The fungus produces another type of spore (conidia) over the infected area after six to eight days. The conidia and fungus mycelia on which they are formed give the powdery or dusty appearance to infected plant parts. The conidia serve as “secondary inoculum” for powdery mildew infection throughout the remainder of the growing season. It is important to note that a primary infection caused by one ascospore can result in the production of hundreds of thousands of conidia, each of which is capable of causing secondary infections that spread the disease. Temperatures of 68 to 77 degrees F are optimal for infection and disease development, although infection can occur from 59 to 90 degrees F. Temperatures above 95 degrees F inhibit germination of conidia and above 104 degrees F they are killed. High relative humidity is conducive to production of conidia. Atmospheric moisture in the 40 to 100 percent relative humidity range is sufficient for germination of conidia and infection. Free moisture, especially rainfall, is detrimental to survival of conidia. This is in direct contrast to most other grape diseases such as black rot and downy mildew that require free water on the plant surface before the fungus spores can germinate and infect. Low, diffuse light seems to favor powdery mildew development. Under optimal conditions, the time from infection to production of conidia is about seven days. It is important to remember that powdery mildew can be a serious problem in drier growing seasons when it is too dry for other diseases such as black rot or downy mildew to develop. Select an open planting site with direct sunlight. Plant rows in the direction of the prevailing wind in order to promote good air circulation and faster drying of foliage and fruit. Prune and train vines properly in such as way as to reduce shading and increase air circulation. Varieties differ greatly in their susceptibility to powdery mildew. Cabernet Franc, Cabernet Sauvigon, Chancellor, Chardonnay, Chelois, Gewurztraminer, Merlot, Pinot blanc, Pinot noir, Riesling, Rosette, Rougeon, Sauvignon blanc, Seyval, Vidal 256 and Vignoles are all highly susceptible. On susceptible varieties, control is based on the use of properly timed applications of effective fungicides. Early season (prebloom through bloom) control of primary infections caused by ascospores must be emphasized. For the most current fungicide recommendations and spray schedules, commercial growers are referred to Bulletin 506, Midwest Fruit Pest Management Guide, and backyard growers are referred to Bulletin 780, Controlling Diseases and Insects in Home Fruit Plantings. These publications can be obtained from your county Extension office or the CFAES Publications online bookstore at estore.osu-extension.org. Figure 4. 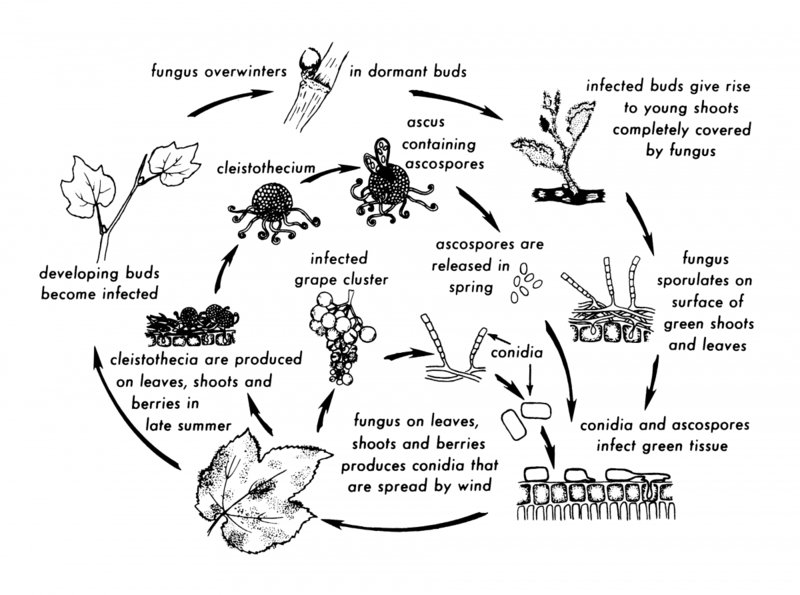 Disease cycle of grape powdery mildew. We wish to thank the New York State Agricultural Experiment Station for use of this figure. It was taken from Grape IPM Disease Identification Sheet No. 2.